John Wesley's visits to nearby Padiham, in the last quarter of the eighteenth century, resulted in a fellowship of Methodist people, initially established at a farmhouse called Shayhouses outside Whalley village on the Clitheroe Road. The first premises owned by Methodists in Whalley were the upper rooms of two linked cottages in Church Lane Whalley, purchased in 1806 and used as their meeting place for over sixty years. Although part of the Clitheroe circuit, which was formed in 1812, it was not until 1872 that the present Methodist Chapel was built on the main street of the village. 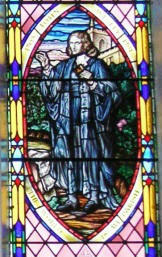 The Wesley Window, dedicated to the original founds of Methodism in the village, has three panels. The left panel depicts Charles Wesley and the right panel John Wesley. with the centre panel depicting the wise men. There are also three beautiful stained glass windows in the Church. 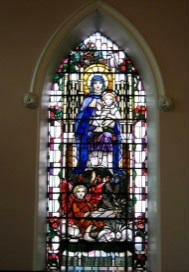 The Madonn a and Child Window (left) - it is unusual for a Methodist Church to have a window portraying Mary with the infant Jesus. Like the St. Francis of Assisi Window (right), the window was designed by the eminent arts and crafts artist Veronica Whall. Both windows were commissioned by Joseph Davis. One was in memory of his mother Mary, the other in memory of his brother Francis Edward, who was killed in the First World War and his father also called Francis. Veronica Whall, 1887-1967, was the daughter of the master Arts and Crafts stained glass artist Christopher Whall and studied under her father at the Central School of Arts and Crafts. At the age of thirteen she designed one of the windows at Gloucester Cathedral. With her father she founded the firm of Whall and Whall in 1922 working until her retirement in 1953. Windows by Veronica Whall can be found in churches in Cumbria, Lancashire and Greater Manchester. The windows in Whalley are considered some of the finest examples of her work. If you would like to see the windows in person, we suggest you come along to one of our Sunday services, as the church is not left unlocked for general visitors.